Animal behavior has fascinated everyone from young children to scientists for centuries. Humanity’s interest expanded when we discovered the incredible distances that animals will travel. This explains why no student has ever completed their education without a lesson on the migratory patterns of various animals, and thus why, “birds fly south for the winter” is now household knowledge. We know that animal migration is as much a part of Earth’s evolutionary history as the rocks on it, so you might be wondering - what has us so interested now? We’re glad you asked. Understanding how and why animals move through and between resource-rich habitats can help us craft successful management plans to recover and maintain their populations. In the ocean, we seldom know these basic behaviors which are a requirement for their survival. In order to accomplish this, we must tag and track animals to reveal their behaviors, movement paths, and important life-history locations--like where they breed and feed--to better mitigate human impacts. Simply put, protecting them requires an understanding of where they go and what they do when they go to a particular place. This growth of the emerging discipline known as Movement Ecology is currently restricted due to lack of innovation in tracking systems. For decades, animal tracking has been accomplished with a variety of animal tracking tags that currently deliver telemetry data to the Argos satellite system. Argos has two main functions, the first is to provide daily list of any type of tag that transmits to the satellite (on their specific frequencies), and relay that data back to us on Earth. The second function includes the first but adds a tracking function. For example, PTT 'beacon’ tags are tracked by using the ‘Doppler Shift’ effect of fast-moving satellites in relation to relatively static tags. This effect, combined with software analysis, determines the location and movement path of tagged animals in near real-time. Unfortunately, this system is constrained by the limited number of satellites, data bandwidth, transmission costs, and spatial coverage on Earth. Additionally, proprietary systems do not have an open standard for transmitting data, leading to limited receiving and tracking options. The current system of tracking animals often leaves biologists with more questions than answers. This is especially true for marine mammals, sharks and sea turtles that may only occasionally surface--providing a narrow window of time to locate them and transmit invaluable data. In addition, the error rate on a location can be in excess of 1500 m depending on its latitude. Scientists are missing out on valuable data due to the spatial and temporal coverage, accuracy, and restricted data packet size of the current system. A solution to these challenges would drastically improve our ability to protect and conserve endangered and vulnerable species. The Bureau of Ocean Energy Management (BOEM) has teamed with the National Aeronautics and Space Administration (NASA) to find a solution that private industry, academia, conservation scientists, and government agencies are deeming a necessity. BOEM is charged with the great responsibility of protecting the environment while ensuring the safe development of the US’s offshore energy and marine mineral resources. NASA is interested in investigating various opportunities for the potential use of small satellite (SmallSat) technology, such as CubeSats, for remote surface tracking capabilities on future lunar or other deep space destinations. It also aligns with NASA’s goal to support other Federal agencies’ work and to test, validate, and optimize innovations. A CubeSat (U-class spacecraft) is a type of miniaturized satellite for space research that is made up of multiples of 10×10×10 cm cubic units. CubeSats have a mass of no more than 1.33 kilograms per unit, and often use commercial off-the-shelf (COTS) components for their electronics and structure. 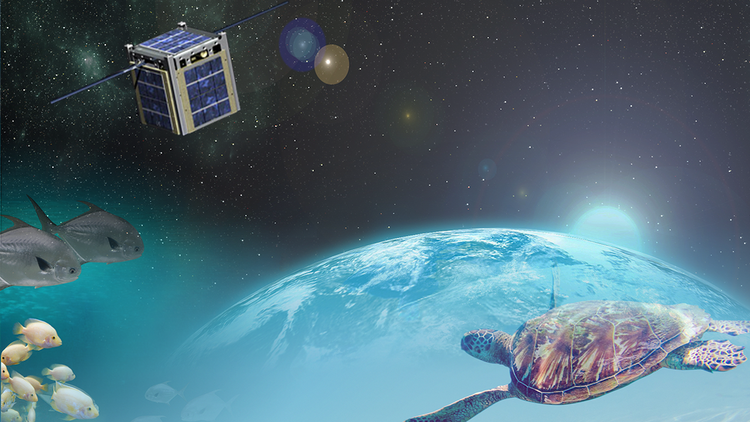 NASA and BOEM see great promise in the potential for SmallSat technology to play an integral role in the future of animal telemetry data collection and standards. When imagination meets reality, the potential for major advancement in movement ecology is unlimited.